You can “save” a half can of soda for a few extra days, without losing the fizziness and flavor. If you tip over the can — with the lid screwed on — it won’t spill, thanks to the rubber seal found inside the cap. 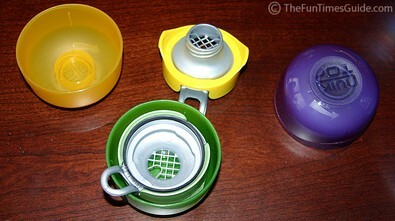 The opened top is a wide-mesh plastic, so it keeps flies and other bugs out of your drink. The lid cover doubles as a coaster to prevent water rings. They’re easier to drink out of (without spilling) than a can is. The different colored tops (you get 5 different colors per “set”) make it easy to differentiate between different people’s drinks — either in the fridge or at a party. They’re great for people on the go because it’s easy to put a lid on your drink and travel, without spilling a drop! There’s a built-in can tab opener, so you won’t ruin your nails opening cans. For what it’s worth, I gave 2 of the 5 lids I received to my mom as a Christmas gift. She loves ’em! So Which Is It?…Pop, Soda, or Coke? I’ll Never Buy Plastic Food Storage Bowls Again!